Or could it be a Note 10 Plus or Note 10e, or a 5G device? What do you need to know about 5G? We'd previously heard of a second Note 10 device, a 5G-enabled model similar to the Galaxy S10 5G – likely larger than the typical Note 10, as the S10 5G is larger than the S10. 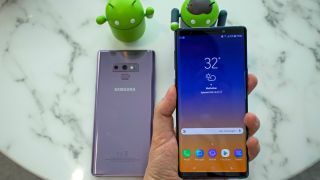 It’s possible that the 6.7-inch display phone will be the Note 10 5G, and the standard Note 10 will have a screen similar to the Note 9’s 6.4 inches. Could the Samsung Galaxy Note 10 have no buttons around its edges?